A paper titled “Indifferentiability of Truncated Random Permutations” by PhD candidate Wonseok Choi and MS candidate Byeonghak Lee (under Professor Jooyoung Lee) from the KAIST Graduate School of Information Security (GSIS) won first place in Crypto Contest Korea 2018. Byeonghak Lee became a repeat winner since his paper titled “Tweakable Block Ciphers Secure Beyond the Birthday Bound in the Ideal Cipher Model” also received an award at Crypto Contest Korea 2017. The contest, hosted by the Korea Cryptography Forum, the Korea Institute of Information Security & Cryptology, and the National Security Research Institute and sponsored by the National Intelligence Service, was held for promoting cryptography in Korea. The total prize money is fifty million won with ten million won going to the first place winners. The contest was divided into three divisions: paper, problem solving, and idea. Among the three divisions, first place came from the paper division only. Besides first place, KAIST students showed outstanding performance in the contest. PhD candidate Seongkwang Kim received participation prize while he also received special prizes with MS candidate Yeongmin Lee. The hacking club GoN (under Professor Sang Kil Cha), comprised of undergraduate students from the GSIS was awarded the grand prize in the division of problem solving. The award ceremony was held during the Future Crypto Workshop 2018 on November 15. 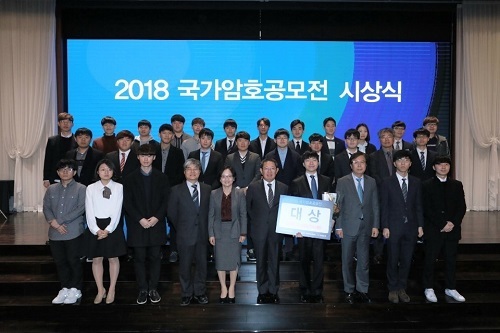 The awards ceremony for Crypto Expert Korea 2018 were also held there, and PhD candidate Ji-Eun Lee from the School of Computing and Byeonghak Lee received awards, the grand prize and runner-up prize respectively.